Quito, Ecuador, 9 November 2014 - The Eleventh Meeting of the Conference of the Parties (COP) to the Convention on the Conservation of Migratory Species of Wild Animals (CMS) concluded today after six days of intense negotiations aiming to set conservation actions for the benefit of the world’s migratory species for the coming years. The Conference, held in Latin America for the first time, attracted over 900 delegates – a record for CMS – representing Parties, non-Parties, IGOs, NGOs and the media together with a large number of leading experts guiding global conservation efforts for the world’s avian, aquatic and terrestrial migratory species. “The Conference in Quito has generated an unprecedented level of attention for the Convention,” said Bradnee Chambers, the Convention’s Executive Secretary, “Like never before in the 35-year history of CMS, migratory animals have become the global flagships for many of the pressing issues of our time. From plastic pollution in our oceans, to the effects of climate change, to poaching and overexploitation, the threats migratory animals face will eventually affect us all”, said Chambers. Thirty-one proposals to add species to the Convention’s two appendices to improve the conservation status of endangered species were approved. 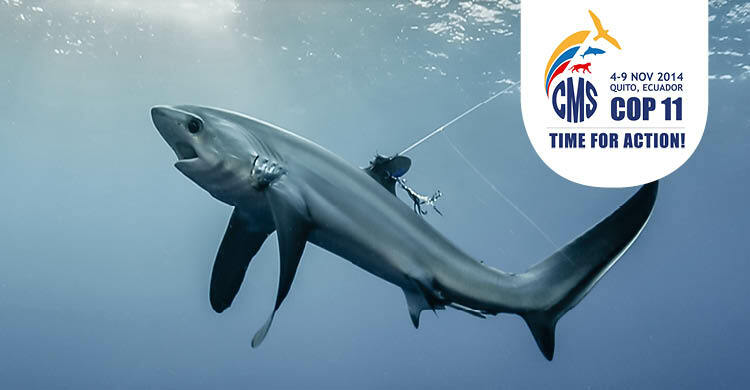 These included the addition of a record number of 21 shark, ray and sawfish species proposed by Kenya, Egypt, the European Union, Fiji, Costa Rica and Ecuador - leading the Conference to be dubbed the “Sharks COP” in some circles. Cuvier’s beaked-whale proposed by the European Union was added to Appendix I and the Polar Bear (Norway) was added to Appendix II. For bird species, the Semipalmated Sandpiper (Ecuador and Paraguay), the Great Knot (Philippines), the European Roller (European Union) and the Great Bustard (Mongolia) were listed on Appendix I, while the Canada Warbler (Ecuador) has been confirmed for Appendix II. The Red-fronted Gazelle (Niger and Senegal) will benefit from full protection, whereas international cooperation is recommended for the White-eared Kob (Ethiopia) following its inclusion in Appendix II. The European Eel (Monaco) has been added to Appendix II. “Ecuador is proud to have been given the historic opportunity to host CMS COP11. Our country is not only the first to defend the Rights of Nature, it is also home to an extraordinary variety of migratory wildlife,” said Lorena Tapia, Minister of Environment of Ecuador. A High-Level Ministerial Panel on 3 November on “Uniting the Rights of Nature and the Green Economy in the Context of Sustainable Development and Poverty Eradication” directly preceded the COP. Chaired by Lorena Tapia, the panel included environment ministers from Asia, Africa and Latin America and Executive Secretaries of Multilateral Environment Agreements and the CEOs of some of the world’s largest conservation NGOs as well as key experts. “Ecuador proposed the listing of a number of bird and shark species to ensure that they receive better protection. Together with the international community, we will continue to ensure safe passage for the travellers of our natural world,” said Tapia. "The decisions made by Governments at the CMS Conference reflects the growing awareness that the responsibility for protecting wildlife is a shared one, and that the threats to wildlife can be tackled most effectively through global cooperation," said Achim Steiner, UN Under-Secretary-General and Executive Director of the United Nations Environment Programme, which administers the Convention. "International agreements such as the CMS work on behalf of citizens and communities around the world who wish to conserve and protect our natural heritage. They are an expression of our shared commitment that the pursuit of human development does not come at the expense of our natural world," said Steiner. Tine Sundtoft, the Norwegian Environment Minister, proponent of the Polar Bear listing said “Norway is deeply committed to the conservation of polar bears and to the continued cooperation with Range States, other countries and stakeholders to achieve this end”. The Polar Bear, the largest apex predator on Earth is affected by climate change that has led to the loss of 2 million m2 of sea ice. The Appendix II listing introduces the global perspective of existing threats to Arctic species stemming from shipping and oil exploration, making it a case for all CMS Parties. Three Species Action Plans were approved: for the Argali Sheep in Central Asia, the Pacific Loggerhead Turtle and the Saker Falcon. In addition a regional initiative covering large migratory mammals in Central Asia, such as the Bactrian Camel, the Snow Leopard and the Saiga Antelope, was launched together with an accompanying publication called “Central Asian Mammals Initiative: Saving the Last Migrations”. During their extended journeys, migratory birds face serious threats. While in the past a sustainable level of trapping in nets had taken place, huge numbers have fallen victim of illegal trapping and killing for consumption and trade in recent years. Countries now agreed to take action against illegal hunting. The adoption, by CMS Parties, of the global Guidelines to Prevent the Risk of Poisoning of Migratory Birds is a significant step forward. A key element enshrined in the Guidelines is to phase out the use of lead gunshot in all environments over the next three years. Overexploitation and poaching remains a key threat. Initiating regional cooperation to better protect migratory animals across political borders is part of the Convention’s mandate. CMS plays a unique role in the fight against wildlife crime in the fields of transboundary conservation, training of local staff, law enforcement and creating alternative livelihoods. The increasing levels of poaching of species such as the African Elephant have brought this issue to the fore. For the first time, the threat posed by renewable energy technologies to bats, birds and cetaceans was on the agenda. Guidelines on how wind turbines, solar panels, dams and other forms of renewable energy developments can be deployed in a wildlife-friendly manner were also adopted by COP. In the marine environment, Resolutions were passed concerning plastic and other debris, cetacean culture, live capture of cetaceans and boat-based wildlife watching. Parties adopted the Strategic Plan for Migratory Species, which mirrors the Aichi Targets of the Convention on Biological Diversity to meet the Parties’ requirement that biodiversity-related agreements work ever more closely together. The objective of the Plan is to help integrating the needs of migratory species in national and international action plans. Details on how CMS and the civil society should implement the Strategic Plan including indicators to measure progress will be made available at COP12 in 2017. In their closing comments many delegates said the COP11 marked a milestone in the development of the Convention, which was better placed than ever to fulfill its mandate to conserve endangered migratory species. Administered by the United Nations Environment Programme (UNEP), the Convention on the Conservation of Migratory Species of Wild Animals (also referred to as the Bonn Convention, after the German city in which it was signed) held its 11th Conference of the Parties (COP) in Quito, Ecuador, from 4 - 9 November. Negotiated in 1979, CMS works for the conservation of a wide array of endangered avian, aquatic and terrestrial migratory animals worldwide. The Convention currently has 120 Parties. The Conference of the Parties (COP) is the principal decision-making body of the Convention and meets every three years. Listing on CMS Appendix I carries an obligation on Parties for strict protection, such as bans on take. Appendix II listing commits countries to coordinate transboundary conservation measures throughout the species’ range.